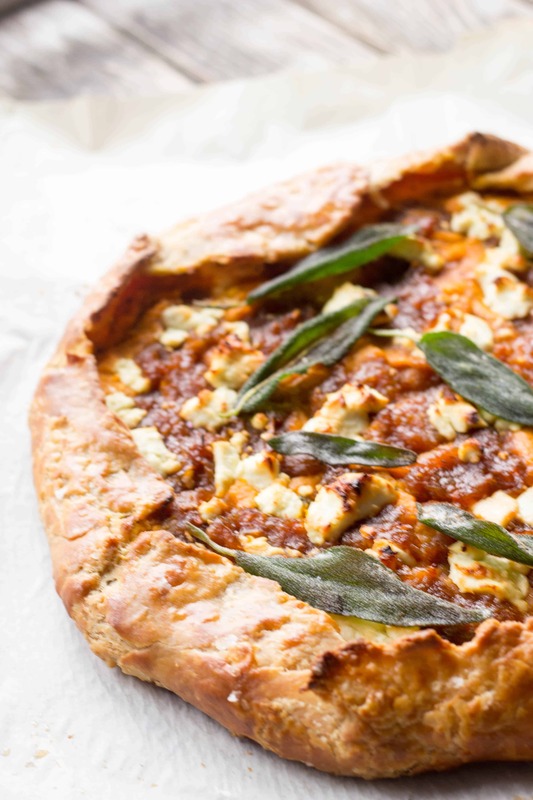 Brown butter pumpkin galette topped with caramelized onions and tangy goat cheese. 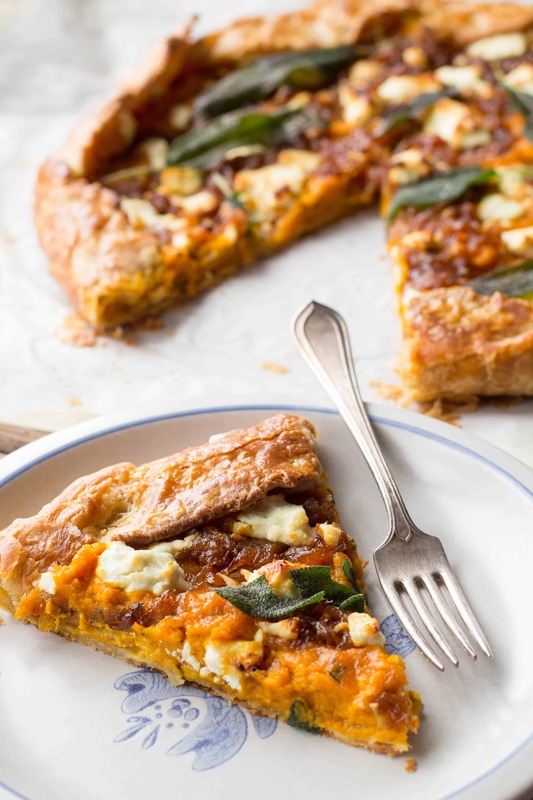 This savory pumpkin galette makes a perfect Thanksgiving appetizer! It’s Thanksgiving week! Time to turn on the oven, crank up the tunes and bust out your fanciest pair of stretchy pants. We’ve got a lot of work to do. Chaser has to work at the firehouse this Thursday, so I’ll be heading down to my aunt’s to help out with the cooking. It’s always a bummer when he has to work on a holiday, but the silver lining is that we won’t have to spend half the day in the car schlepping from one family to another. Instead, I get to post up in the kitchen all day, basting the turkey and sipping my wine without having to worry about being anywhere but present in the moment. I’m really looking forward to that, but I’ll miss getting to see the other side of my family and Chaser’s. When it comes to the big spread, we keep it pretty traditional in my family – and I like it that way. I don’t want a chipotle brined turkey, chorizo and mushroom stuffing or a coconut cranberry layer cake. I’m sure they’re all delicious, but to me, they’re just not Thanksgiving. When I sit down at the table I want it to taste like the fourth Thursday in November, not like I just showed up at the trendiest new restaurant in New York. I want a simple, juicy roasted turkey with all the fixings. I want buttery herb stuffing, creamy mashed potatoes, plain, unadulterated corn (the frozen kind), and I want to slather it all in a rich, flavorful gravy. I want pumpkin pie in its purest, most basic form: with canned pumpkin, evaporated milk and just the right amount of spice. I want my Grandma’s apple pie and whipped cream from a can. It’s the only time of year I get to indulge in this sort of food, and I’m not ever willing to stray. I will admit, however, that there is a place on the table to get creative, and that’s with the appetizers. Apps are often the most overlooked part of Thanksgiving because all the emphasis is on the big dinner. The only appetizer that’s tradition in our family is wine. Besides booze, it’s usually just your basic cheese and crackers or crudités, if anything at all. But then again, we eat dinner at like 2pm, so as long as you’ve had breakfast, you’re not missing much. This galette is the result of mixing together a few of my favorite holiday flavors: butter, pumpkin, sage and PIE. 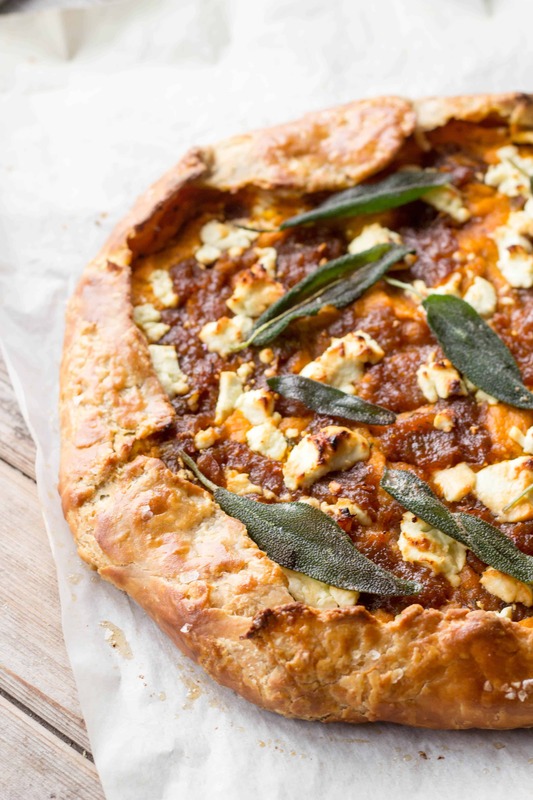 I love the idea of serving a savory pie before the big meal, as many people are often too full to indulge in dessert (not me, for the record). It is my rule that everyone, even those without sweet teeth, must have pie on Thanksgiving. I start by whipping up a classic French pâte brisée, which is a little bit different from my typical pie dough. The difference being that it uses all butter and the addition of an egg, but the technique of making it is exactly the same. I find the addition of that egg helps keep this free-form tart intact, and using all butter and no shortening really heightens the flavor of the brown butter in the filling. I switch it up for this recipe by using half whole wheat flour in addition to white flour. 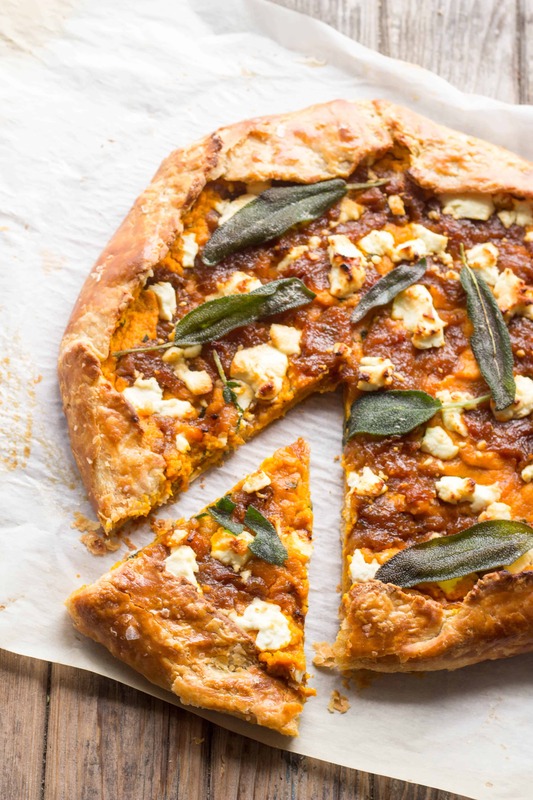 The slight earthy flavor plays up nicely against brown butter, pumpkin and sage. Plus, using the words “whole wheat” makes it easier to pretend this is actually healthy. All that being said, if you happen have some leftover pie dough lying around, by all means, use it. I have preached many, many times about the beauty and magic of brown butter. I just love the stuff. It enhances pretty much anything it comes in contact with, and it needs to be somewhere on your holiday table. Might I suggest in this tart? It has all the familiar flavors of Thanksgiving wrapped up into a pretty little package, ideal for filling the tummies of hungry guests who would otherwise be tempted to start picking at the turkey skin. Everyone knows that all that brown, crispy skin belongs to one person and one person only: the cook. And, hey! Remember those caramelized onions we made last week? They get put to good use in this here recipe. Their sweet, deep flavor is such a wonderful compliment to the tangy goat cheese and creamy, buttery pumpkin. Be sure to make a little extra – they’ll be SO good on your turkey sandwich come Friday. I hope you all have a warm, festive, safe and delicious Thanksgiving. 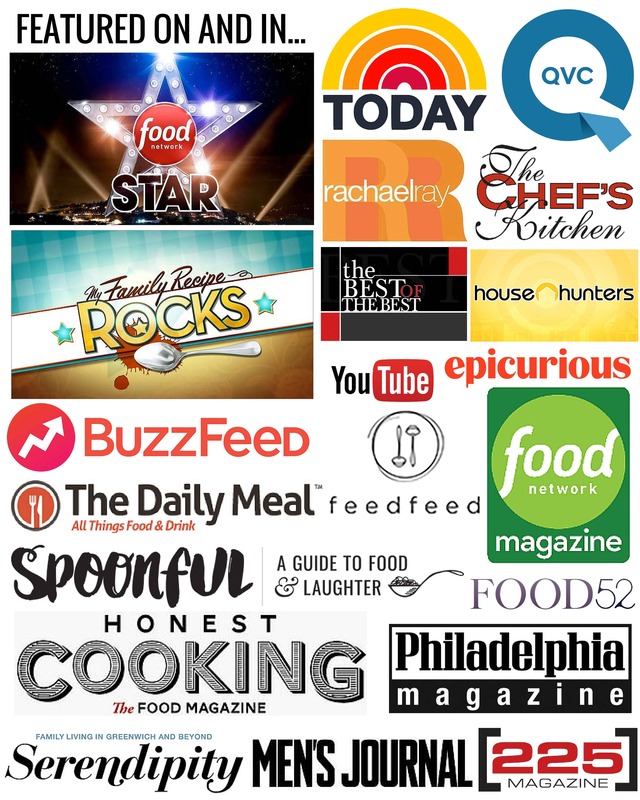 I’m so incredibly grateful to have you all show up each week to read, watch, cook, comment, share and (hopefully) laugh. Make it a great one. Mix together the flour and salt in a medium bowl. Use a pastry cutter or a fork to cut the butter into the flour for a few minutes, until the butter is broken into pea sized pieces. Melt the butter in a saute pan over medium heat. Keep a close eye on it as it sizzles, foams, and eventually turns brown and smells nutty. Add the minced sage and immediately remove from the heat. Add the pumpkin puree to a bowl and pour the butter in. Add the egg and salt, then mix until the butter is fully incorporated. Preheat the oven to 425 degrees. 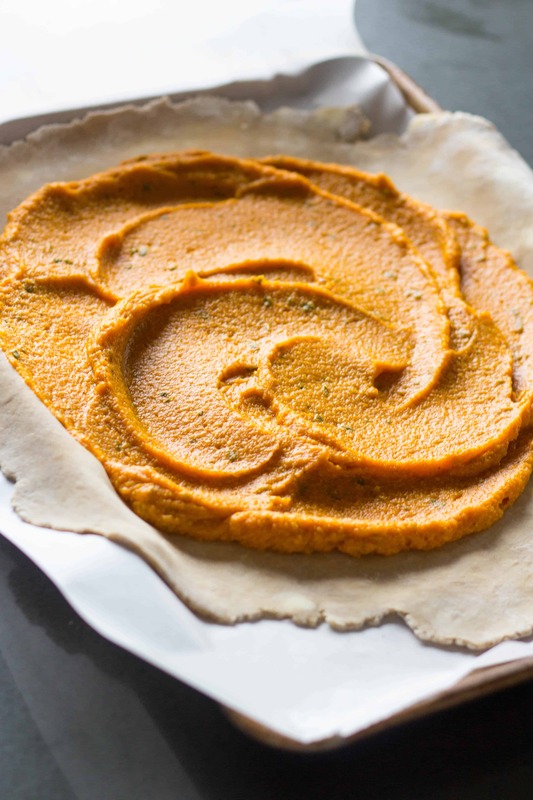 Roll out the dough to about a 12″ circle and transfer to a parchment lined baking sheet. Spread the pumpkin mixture in the center, leaving a 2 inch border around the outside. 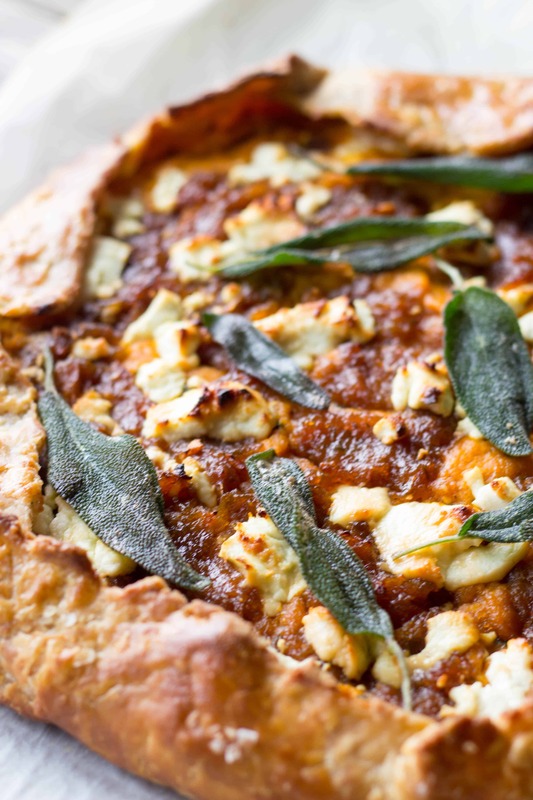 Distribute the caramelized onions evenly over the pumpkin, then crumble the goat cheese on top. Drizzle with honey, then scatter whole sage leaves randomly but evenly over top. Gather and fold the dough up around the sides to enclose the filling. Brush the exposed dough with the egg wash, then lightly sprinkle flaky sea salt (if using) on top. Bake for about 25-30 minutes or until the crust is golden brown. Remove from the oven and allow to cool for at least 20 minutes before serving. To achieve a tender, flaky pie crust, the dough needs to stay cold at all times. Be sure to start with chilled ingredients and place the bowl in the freezer for a few minutes if it’s starting to get too warm. Placing the prepared tart in the freezer for a few minutes before baking ensures that the crust will be super flaky. This looks amazing! 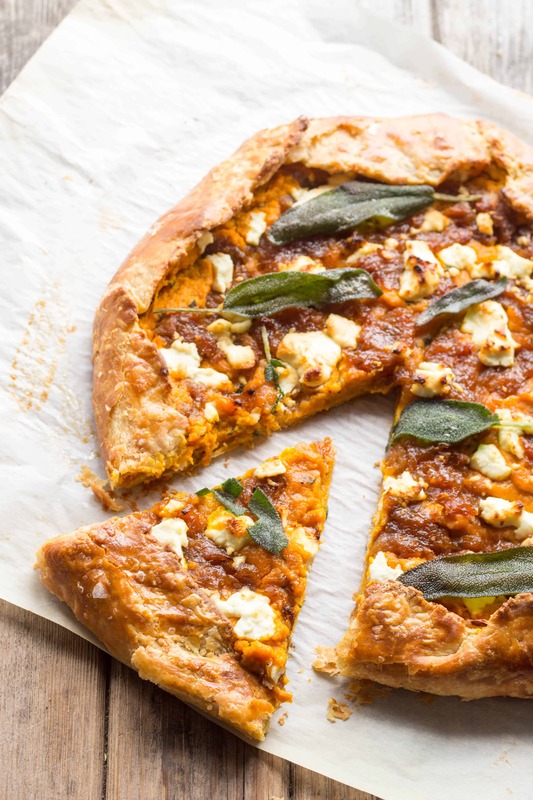 Love that you mixed pumpkin, goat cheese and sage – yes please!! It’s like you made this galette especially for me! Seriously, I’m in love with every single ingredient listed here. I need to try this! Like the others have said… ALL my favorite ingredients… and I have sage growing in my garden… YAY! Regarding Thanksgiving desserts: We also have the traditional apple, pumpkin and chocolate pecan pies (oh baby! ), but we started to do something a little different in the past few years. It’s only immediate family that comes to Thanksgiving so we don’t have to put on a big showy display… only about 9 of us there. We sleep over hubby’s sister’s house the night before… we bake and prep the bird, drink wine, put together a jigsaw puzzle. THEN… the next morning…. we…. eat,,, some of the pies! (shhhhhh). It’s SOOOO GOOD in the morning instead of after a feast! We always have plenty of pie for after our tummies have digested, but the flavors are SO much better on an empty stomach. To everyone out there… Feel free to hijack this new tradition if you wish. You’ll thank me later! Have a wonderful holiday, everybody! Stop it! Just… STOP IT!!! I can only fit so much in this belly of mine, Missy! Pumpkin cinnamon muffins??? REALLY??? Dang! I want you as my adopted daughter… NOW! Hehehe!